All transactions are safe and secure with a reliable history in online purchasing behind each of our associates. Buy the One Man Wolfpack t-shirt to own Hangover clothing and merchandise. Let me remind you of Alan's rooftop speech by dictating a portion of it for you. "I tend to think of myself as a one man wolfpack, but when my sister brought Doug home, I knew that he was one of my own and my wolfpack, it grew by one. So there were two of us in the wolfpack. I was alone first in the pack and then Doug joined in later." As you know, his ramble just keeps getting better. Get Alan's One Man Wolfpack t-shirt to add to your collection of Hangover tees. Be sure to put on Alan's Hangover sunglasses and costume beard with either this tee or Alan's Human Tree shirt featured here. 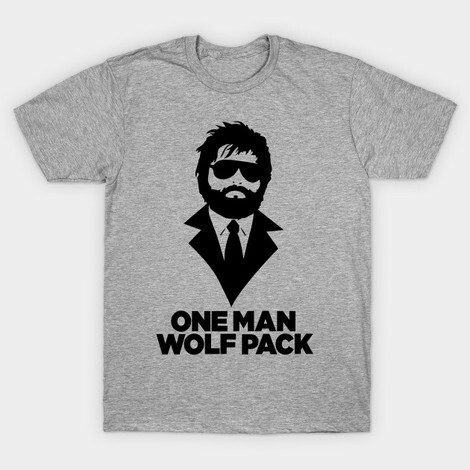 In addition to the One Man Wolfpack tee above, browse the Hangover Clothing Gallery for more apparel like men's and women's clothes, kids shirts or hoodies.